We are a family owned and operated 6,000 square feet ballroom in the heart of Miramar, FL. Our focus is on providing an all-inclusive event experience. From wedding ceremonies, wedding reception, baby showers, and birthday celebrations and much more under one roof. Our award-winning ballroom in Miramar has been a staple in the Miramar community for 12 years. 1. We are a stand-alone facility. Because we are not in a shopping center, your event enjoys the privacy of being in its own building with ample parking. 3. We take only one event per weekend. This means our staff and resources are solely focused on you and your event needs. 4. 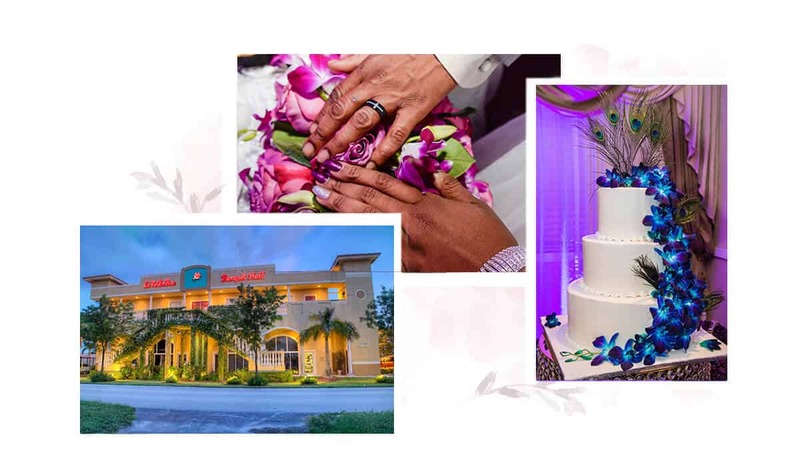 Our banquet hall in Miami offers a variety of services including photography, videography, DJ, cakes, décor, sound & light, and limousine services. 5. Our menu is diverse and includes American, Latin, Italian and Caribbean cuisines. 6. We have over 70 different choices for linens and can even offer custom linens to fit your exact wedding palette. 7. We have a wide range of décor options. Once you have selected us as your venue, you meet with our designers to create the event of your dreams. 8. We have an outdoor ceremony space, indoor ceremony space and 6000 square foot ballroom, allowing you the opportunity to host everything at one facility. This means less hassle and more time to enjoy your special day. One of our team members will contact you within the next 48 hrs after you have sent the message. You can also use the contact information below to give us a call right away or shoot us an email.